HomeBlogClick boardsFlash 4 – an awesome mass storage for your embedded applications. Flash 4 – an awesome mass storage for your embedded applications. Flash 4 click is by far the most superior flash click we’ve made. The key feature of the click board™ is fast performance. That is why you can use it for the code shadowing, execution-in-place (XIP), and data storage. It features the S25FL512S Flash memory module, which has combined the high-performance MirrorBit® technology and Eclipse™ architecture. The 512 Mbit SPI Flash memory module is one of the fastest and most reliable Flash modules on the market. It comes in the package which also includes the mikroSDK™ software and a library with all the functions. The Click board™ comes as a fully tested and approved prototype. As such, it's a reliable device ready to use on the development board. 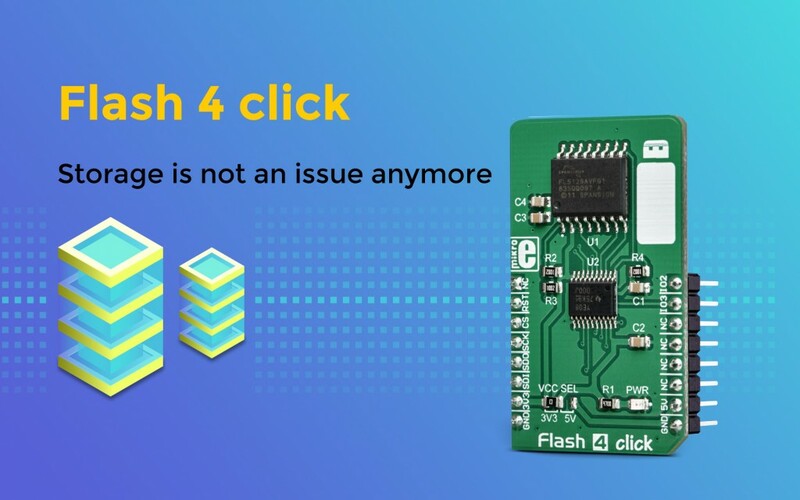 Flash 4 click is a perfect solution for the mass storage option in various embedded applications.